Why Should I Take a Freediving Course? To kick off the launch of our new Ninja Freediving School we have asked Lucrecia Fabre, founder of Amancay Freediving – one of Mexico’s top freediving schools – to help answer one of the biggest questions we see in the sport! Why should I take a freediving course? This is the first part of our new ongoing freediving article series, so make sure to check back soon for more! As the owner of a freediving school in Mexico, quite often I am asked, ‘why should I take a freediving course?’ Or asked if a person can skip Level 1 and go straight to the next level because they “are already freedivers” (but haven’t taken a formal course before). I find that one of the most common mistakes is the misunderstanding of what a freediving course entails and what are the benefits of proper freediving training. So today we are going to take a little look into this topic. To start, since this is such a new field of research we are constantly seeing updates and changes. So articles you may be reading online or books you may have studied, could very well be outdated information even if they are only a few years old. Although I’m a big fan of the old school and I admire them for being pioneers of our sport there is a lot of info that was once the norm and now today has been proven to be extremely dangerous! You can also find YouTube channels with very valuable information, but if you don’t have the basic knowledge and understanding of the skills you won’t be able to put that information into practice in a safe way and consequently not reap the benefits of it. This is why when I and Amancay Freediving get questioned about doing a course or skipping a beginners level, I always recommend and insist no matter your experience, if you enjoy Freediving, SIGN UP FOR A COURSE! Learn the basics from an experienced instructor that is staying up to date with the new developments and science. Yeah, some things you may be familiar with (you can take it as a refresher) but a lot of others I can guarantee you’ll be surprised by. I’ve yet to meet a student who did not benefit from taking a proper freediving course. What does a freediving course entail? A beginners course combines theory sessions, dry sessions (where you practise skills outside the water), pool sessions and open water sessions. Every agency will have their own ways, but in general they all combine these 4 aspects. Let’s take a minute to look at each one of these a little more in-depth so you have an idea of what to expect. Normally this is the most misjudged portion of the course when students are just thinking when am I gonna get in to the water! But, this part is not only essential but in my opinion, FASCINATING. During this section you’ll learn what happens to your body while you hold your breath. What do the feelings and sensations you have when holding your breath actually mean? 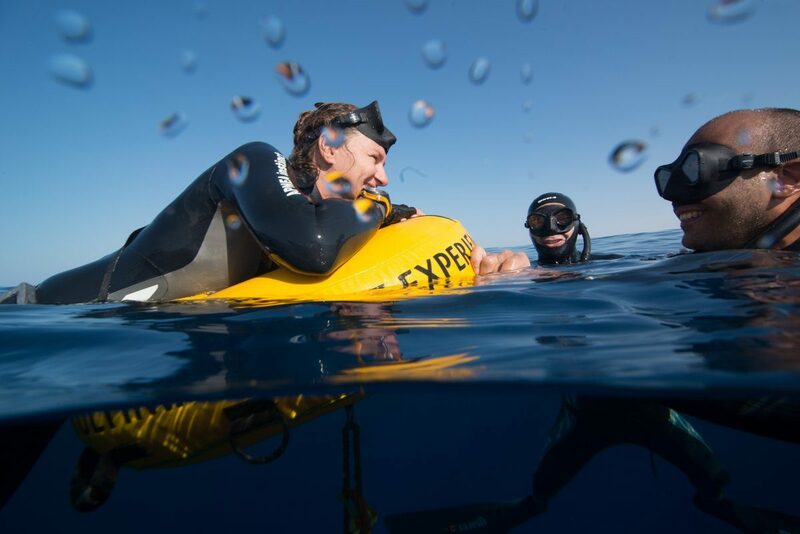 This will lead to knowing how oxygen in our body behaves helping us understand how safe Freediving can be. You will go over physiological changes, what happens to our lungs when we are at depth, and realise how similar we are to dolphins, orcas, seals!! It will remind us that we are mammals, which sometime we forget. During this part you’ll experiment over what you have learned in theory. You’ll put in practice the breathing techniques, you’ll practice holding your breath to get familiar with the sensations, and last but not least, you start to get an impression of your own potential! This is the part of the course we always see students faces light up as they realize they have a lot more potential than they thought they would. This might sound a little boring, but the pool is actually a great place to get comfortable in a controlled environment. You put to action what you’ve learned in the freediving theory and dry sessions. You will be introduced to disciplines such as: Static (did you know the world record is 11:54 min! ), Dynamic, and get to practice safety drills. Pool training is a big part of freediving, if you don’t live in a place with easy access to open water with depth or it is too cold during the winter – look for local freediving clubs you’ll find them practicing in the pool. 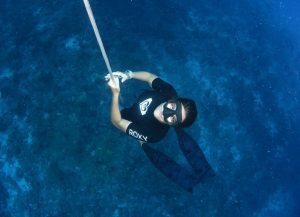 You can even start your courses there and then finish at a nice warm water location like a freediving school in Mexico. Finally, we get to what we’ve all been waiting for! How deep will I’ll be able to go after the course? That’s by far one of the most common questions I’ve came across while teaching freediving! Remember “it is not about the destination, it is about the journey”. Here is where it all begins, but before you start your first dive, let me warn you that this may be a one way trip! Freediving is known to be addictive, so don’t blame me. I’m warning you now. During the water sessions you’ll be introduced to the depth disciplines such as Free-immersion and Constant weight. You’ll learn about diving techniques, body positions for your dives to be more effective and comfortable. You’ll go over different skills that will help you feel confident in the water and at depth, but most important you’ll be doing safety skills, rescues and learning about buddy system. The key for us to learn is combining understanding (knowledge) with practice (water sessions). As they say “practice makes a master”…and by having a teacher with you it will help you make sure that your practise is taking you in the right direction. Lots of questions may arise when thinking about doing a course so don’t hesitate in writing me or one of the experienced staff at Amancay Freediving or Dive Ninja Expeditions. We will be happy to help answer any questions you may have and introduce you to the world of freediving! Hope to see you soon in the water! Interested in starting your journey as a freediver and signing up for a course? Click here to book online today! Co-Founder of Amancay Freediving and introducing people to the water for over 10 years. I’m fascinated with its effect on people. Water is my element — scuba, freediving, or aquatic therapy — no matter how, you will always find there! Interested in joining us on a trip? Just fill out this quick form and our ninjas will be in touch ASAP with more info on our custom dive expeditions! Sign me up for updates on new trips, ninja news & special offers!